What was looking like quite a bad morning for US equities when our alarms went off a few hours ago is looking a lot more manageable now as futures have rallied off their lows. In yesterday’s session, the big star of the day was oil and the Energy sector in general. Driven by a 2.8% rally in crude oil prices, the S&P 500 Energy sector jumped 1.5%. Checking out the charts for oil and the Energy sector show some positive trends. 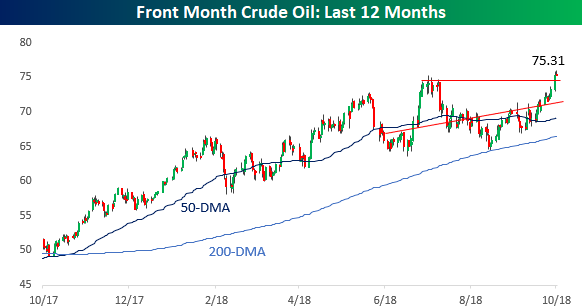 Crude oil prices are relatively quiet today, but yesterday’s rally took the front month future to a new 52-week high with a breakout above the summer highs. 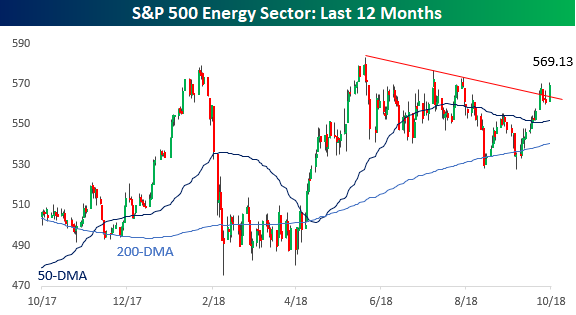 While not at a new high, the S&P 500 Energy sector looks to be on the right path after convincingly breaking its downtrend from the highs in the Spring. Also working in the sector’s favor is that along with the rally in crude oil, natural gas prices also rallied yesterday to their highest prices since January. 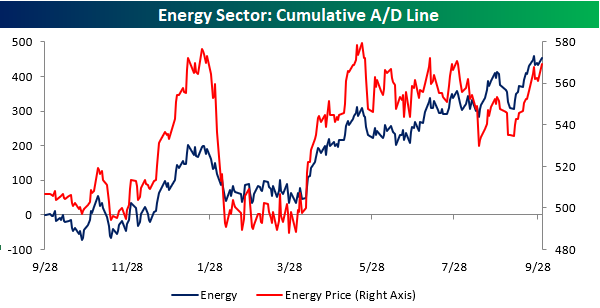 Internals for the Energy sector also look positive.The chart below compares the sector’s price and cumulative A/D line. While prices aren’t yet at new highs, breadth has been strong and consistently trending higher for the last several weeks.